December 2007- Visitors centre of "Meyerwerft"
In the new visitors centre the shipyard demonstrates the high quality production of ships. Besides the history you get a good overview about all special tasks in the "Meyerwerft". Of course you also get a view to the current production of the newest ships. Allways in Decembre the "Meyerwerft" invites the people from the whole region to have a look in the shipyard. 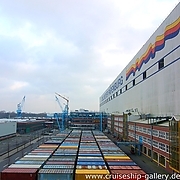 This year we had a look on the new NCL cruise ship "Norwegian Gem" and the "AIDA Diva" . The Diva will leave the shipyard in March 2003.